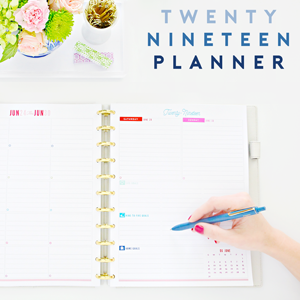 Welcome to Week Two of the "Wait-No-More" Organizing Challenge. To recap, I am focusing on four main areas of our life that need a lot of organizational help. Instead of biting off more than I can chew all at once (and subsequently becoming quite overwhelmed), I am tackling one space each week. And many of you are joining in and working on a few of your own spaces, which I totally love! For this week's organizational challenge, I am focusing on our vehicles. More and more, it feels like our cars are our second homes. We are always heading to school and sporting events as well as running frequent errands, trips to the park and taking off for a weekend away. We live in a small town, so we have to take trips to "the city" quite frequently. All of those miles add up and the interior of our cars have been feeling the traveling pains. We snack in the car, we sleep in the car, we read and play games in the car. I am not one to keep strict rules about food, drinks and toys because I want everyone to be happy and comfortable while traveling. However, my goal is to take back the room on wheels that we spend so much time in, and to find a few ways to better maintain them moving forward. Above you can see my plans for the cars. By Friday, I will (fingers crossed) have before and afters of two messy vehicles turned nice, clean and organized vehicles. Wish me luck! My first step in the process was to address some areas we have been lacking. We have umbrellas near our front door, but what happens when we are heading to the grocery store and a rain cloud comes out of nowhere? We keep our sunglasses in our shoe cabinet, but again, what if we forget them at home and happen to be driving into the sun? What if our oldest gets hit with motion sickness or I happen to get a headache? When we head to the park, there is a high probability that our accident prone kiddo will scrape up his elbow, forehead or knee. And after having three flat tires in the past two years, I can't risk not being prepared for another. All of these things have happened and have left us feeling frustrated that we didn't have some basics on hand. 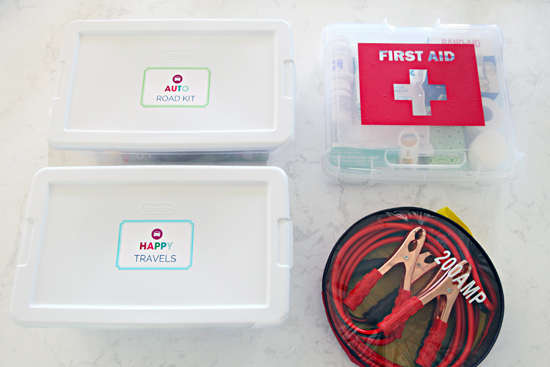 So I decided to put together some kits to help us be better prepared on the road (you all know I love a good kit!). We are still using some of the pouches we put together two years ago here, but since then we have ditched the basket and the rest of the system. The lidded basket was too bulky and we found we didn't move it from car to car (the basket has been working much better in my closet storing off-season items). This time around, I decided to create two of each kit, so that we don't have to do any moving between vehicles. I started by picking up two large fabric bins (similar) from Target. They are a grey, felt-like material and reminded me of the interior of our cars. I also picked up two small craft cases and four plastic shoe boxes. 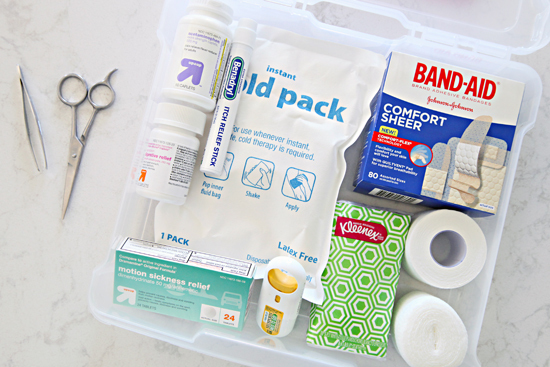 Kit number one is a very simple and basic First-Aid kit. 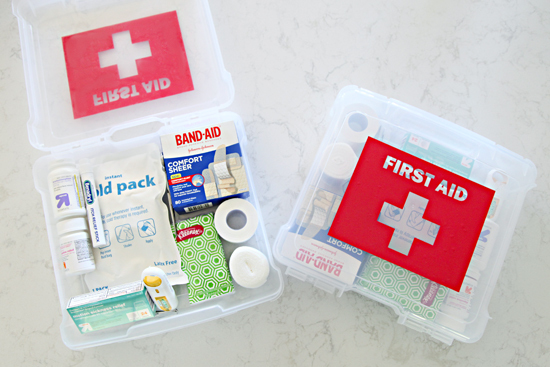 The small craft case was the perfect size for the bandage boxes and medicine bottles. There is still room to add a few additional items if we find we have missed anything, however, we are pretty covered for accidents at the park or ball field. I used my Silhouette die-cutting machine to create vinyl labels for each lid. 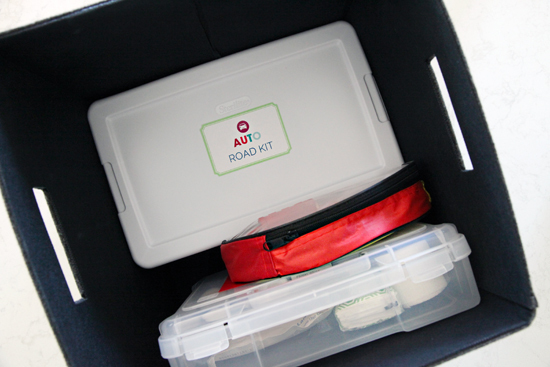 Next up I created a kit to keep behind the driver's seat in each car. My goal is to completely clean out the cars and only keep this single bin of items in each. I used an Avery Office template to create the labels for each kit. 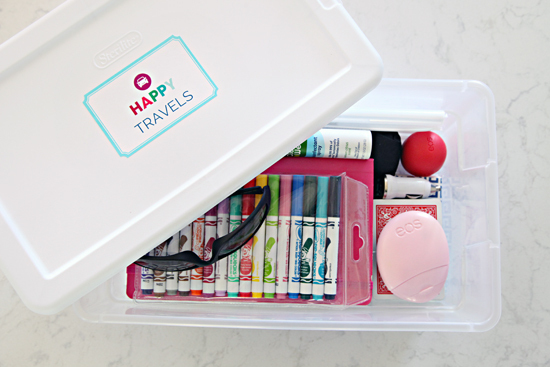 Now, if the kids forget their travel bags, they still have activities to keep them busy. These items are intended to always stay in the car and never go into our home. My guess is the contents may evolve or be swapped out, but I already feel much more prepared knowing that we have some basics on hand anywhere we head. Because you know, hands get sticky and accidents will happen. And again, everything went inside one of the small plastic bins. 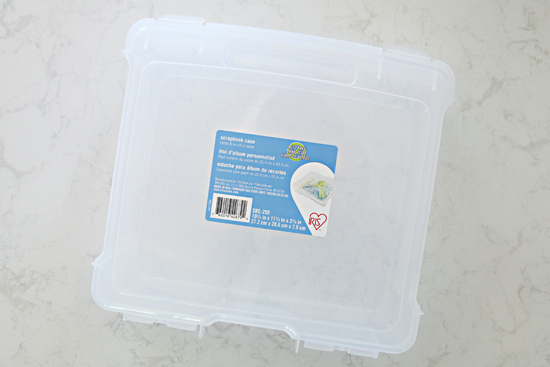 Each container is quite compact, and the shoe box sized bins fit perfectly in the larger canvas bin. 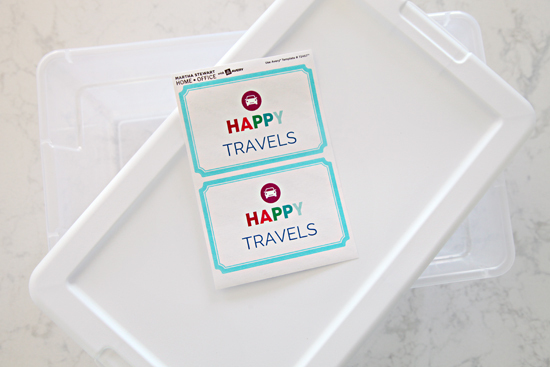 The larger tote will sit in the trunk of each vehicle and the extra space will be used to hold a few reusable grocery bags and a picnic blanket in each (the "Happy Travels" bin will stay behind the driver's seat in the car). To prevent the bins from sliding around in the trunk, I added a few heavy-duty Velcro strips to the bottom side of each. No two families are the same, so what you opt to store in your vehicle most likely looks different than the items I selected. To prepare, I thought about sticky situations where we didn't have what we needed... And just literal sticky situations. Plus, I am always digging in my purse for chapstick, lotion, pens and sunglasses, so it is nice to know that the basics are always within reach. Ok Why I didn't think of the Velcro is beyond me. I have been trying to figure a way to keep my trunk more organized. Right now I am using 31 Utility totes but they slide eveywhere when I don't have anything to hold them in their place. I don't have little one's any more but I do have adult children and a grandchild. I think I will do something like this for their vehicles. Thanks for sharing. No concern about lotions, etc. melting in the heat? 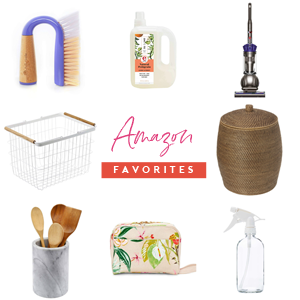 I know even our Virginia summers (we have a 108* heat index as I write this) make it difficult to keep any of those items in my car and usable. Just a thought. We do get a few hot days here in Wisconsin as well, but they are not quite as common here. Hopefully being stored in a small bin behind the driver's seat will keep things shaded. Another option is to keep a portable tote hung near the door with the essential items, so they can come and go with you (although it is just one more thing to remember so not fail-proof). xoxo! Funny, I just sat down to read the blog today only to find out we were on the same page this week. I just pulled the car seats out today because I can't take it anymore. Garbage is out, car seat covers are being washed, and vacuuming has begun. I'm finding all sorts of lost food treasures. Our boys (5, 3, 6mo) are in different stages, and I've found I can get away with stuffing a couple small things in the diaper bag. Less going in the car, less to take out. We always like to keep "just in case" items in the car too! 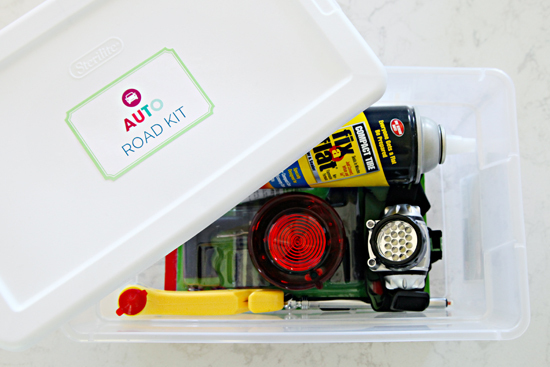 Love these great kits and the Roadside Emergency kits make great Father's Day gifts too! Thanks for the inspiration! Great ideas! In my car I have some of the things you suggest but I also include a bath-size towel, a dog leash, dog collar, and a folding water bowl (from L.L. Bean but I've seen them at many pet supply stores too). For us dog people, we appreciate having an extra leash and collar on hand because you never know... and the collapsible water bowl is an absolute must for post-walk dog hydration. Additionally, over the years we have rescued our fair share of lost and roaming dogs we've encountered. It helps to have the collar and leash to assist with getting them into our car and out of the traffic. The towel is perfect for muddy dog paws after a walk as well as a host of unexpected issues that can and do crop up. Love these tips! We always leave with our pups on leashes so I never thought to grab a spare, but I really love the collapsible water bowl idea. I am always trying to remember a plastic dish when we head out, so to keep a collapsible option in the bin is genius. Thank you! I'm loving this series!! thank you! Yay! That's was I was worried about. Now I feel compelled to go through my way-too-big milk crate in the back of my car and winnow down what I'm carrying along with me all the time. I love your suggestions. Just an idea. I keep my seat-belt cutter/glass breaker in the pocket of the driver's side door. I live near several bodies of water so this is a big concern for me. 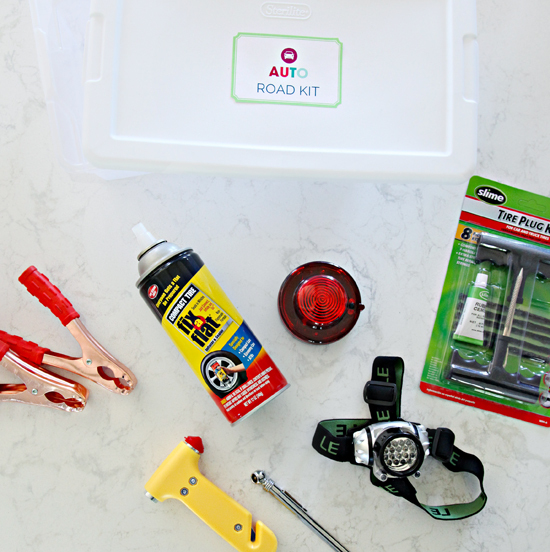 Thank you so much for your Emergency Roadside kit!! My son is going off to college in the fall and I have been planning to create something like this to put in his car when he doesn't have us close by. Living in Oklahoma, any liquids (or things that turn to liquid :-) ) in our cars are out of the question during a good half of the year, as is the case for Chris in Virginia. BUT, like you said, a tote by the door would be a good idea. We still have winter coats (WHY??) hanging on our hooks in the entry way. Maybe I need to spend a day or two morphing this project with the mudroom project from last week! Bags hanging in the entryway specifically for the car! Wow! I am not use to those types of climate conditions. 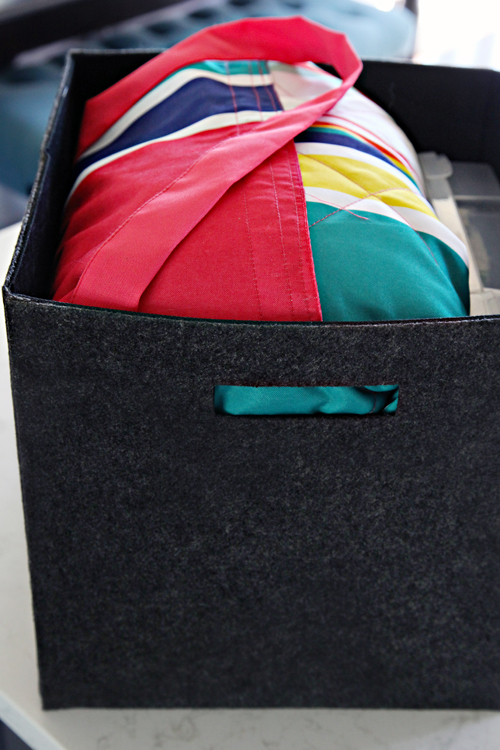 :) I tossed a few insulated shopping bags in each bin as well, they work great! There will definitely be a bit of variety of what people prefer to store in their vehicles based on location and climate. I would add a small fire extinguisher to the car as well! Make sure it 's rated for putting out oil/gas fires, etc. Just curious do your boys now that they are older still carry their bags you posted about a while ago( maybe two years ago now) and if they do, are they still carrying the same things? Now that my boys are at the age of carrying and leaving toys everywhere in the car I'm looking for my organization ideas! Thanks! We still have an use the totes, although, not as frequently. 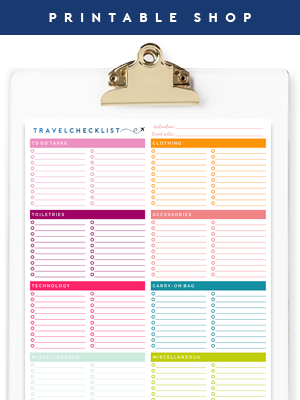 Usually just on longer trips now, they typically just grab a book or notepad for shorter trips. 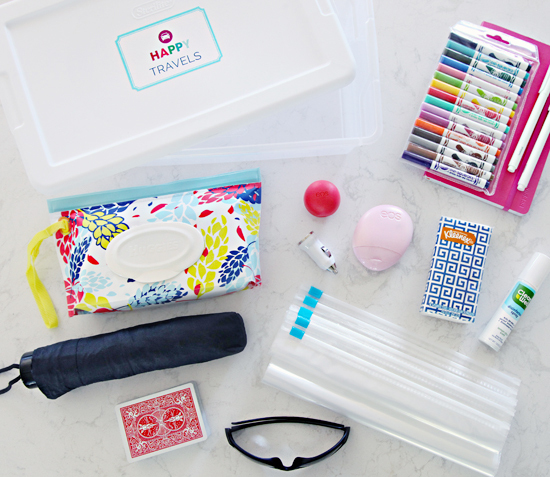 The bags worked great for years, and what you put in them really varies based on current age and phase (but you can never go wrong with small games, activity books, reading books, water bottle, and a few small toys). xoxo! Thanks for this! I'm getting a new car soon (aFter not having one for a year) and this t list to get me set up. And I love your wipes case! Do you remember where you got it? I found them near the Baby Food/Diapering department at our grocery store. It is a newer case that Huggies put out, so I am guessing they are available anywhere diapers/wipes are sold. xoxo! Thanks for the ideas. Do you also keep extra sweatshirts or jackets in the car? I know sometimes at night the weather will cool down or a restaurant will be freezing. I am always cold so it is just second nature for me to grab something from the coat closet on the way out, and I always remind the kiddos to do the same. :) But definitely a great tip! This is brilliant idea! Everything you may need in one place, ready to go! We also keep sunblock, bug spray, and a soccer ball for impromptu park visits. Please don't store the medications in your car. Even in the more mild climate of Wisconsin your car still sees temperatures that beyond the extremes for medication storage. Especially with heat it causes the compounds to break down, not only making the medication less effective but also raising the related substances levels which can be harmful. Take it from someone in the industry...keep the meds in your purse. Phew. So glad you said this. I work in a head office for a pharmacy franchise and was going to say the same. 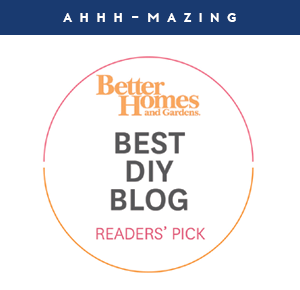 Love your blog, Jen. I'm working on getting my house in shape and you're giving me great ideas. 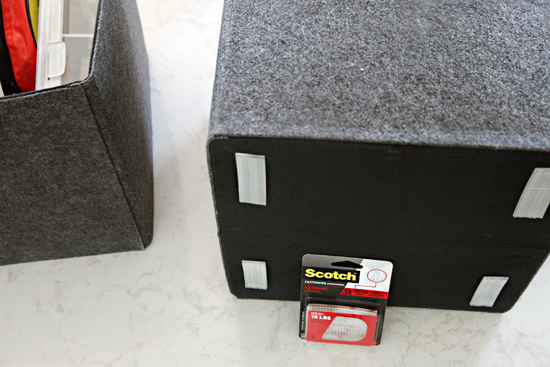 I love the idea of adding the velcro to the bottom of the bin! 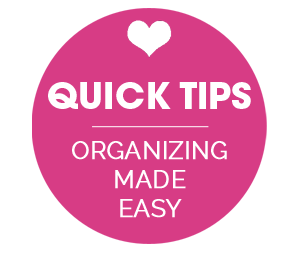 Do you have that organizing project as a printable or is it one for sale in your etsy shop? Never heard them called booster cables, I love it!!! Your bins make our milk crates look downright ugly!! We dont have kids and we do have AAA so we wont need as much but we certainly need something better! Fantastic! Where did you find the headlamp? I've been looking for one with a 3rd strap that goes on top of your head for quite some time. Thanks! I love this idea, it's great. 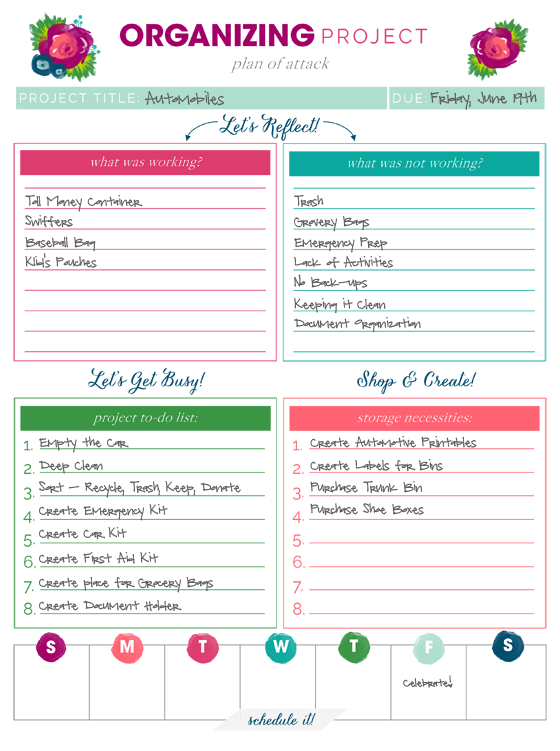 Thank you for the inspiration I love the printables the details of how you go step by step and exactly what you use, I appreciate you taking the time out to show us and inspire us to be more prepared & organized. Tackling my car will be my weekend project. I do have a question though, the happy travels bin, I afraid the markers or crayons might get too hot overt the summer and explode or melt. And if you keep your sunglasses in your car the heat can damage your glasses, your car can get up to 120° and things can melt at that temp.